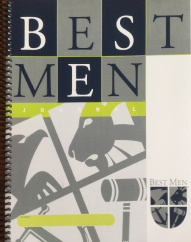 The Best Men logo symbolizes a modern day knight of honor who believes in the values of strength, courage, foresight, truth, and justice. The shield is divided into four quadrants representing key components of the Best Men program. The eagle. A symbol of foresight. The boys focus on daily challenges as well as their future goals. They learn the importance of organization and planning. The lion. A symbol of strength and courage. The boys learn to have the self-confidence to stand up for their beliefs and for what is right. The anchor. A symbol of stability. The boys develop the ability to stand up to negative peer pressure, to make positive decisions on their own and to have self-control. The gavel. A symbol of truth and justice. They boys are taught to be truthful and fair in their dealings with others and to use good decision-making skills in the pursuit of integrity.